I wish I knew, then I'd be able to tap it at will. Often something hits me as I'm knitting on another project. Sometimes I get an idea when I flip through knitting books and magazines. Sometimes I get an idea and can see the completed project in my mind. Too often, I struggle with swatches to come up with just the right pattern (and sometimes I just give up). I'm drawn to texture work that is worked with a single ball of yarn. I get annoyed by the way that the balls tangle with each other and slow me down in colorwork patterns. In fact, I get annoyed with anything that slows down or interrupts my knitting. For example, I prefer to work cables without a cable needle because I don't like to stop and pick up the darn thing. Generally, I examine the sizes of similar garments in books and magazines. If a garment is for me, I copy the measurements of a sweater that I have that fits. Lately, I've been knitting mostly socks, which are much easier to size. In some cases I'm more interested in trying out a pattern than making a particular size. The result is that I have a bin of socks of various sizes. They come in handy when I need a gift. It's hard not be influenced by other designs. They are everywhere. All the garments sold in department and specialty stores were designed by someone. I pay attention to what people are wearing on the streets more often than I brouse through knitting books and magazines. Knitting has been around so long and there are so many hundreds of thousands of patterns that I think it's unlikely that anything is really "new". I must live in a vacuum because I'm not aware of this controversy. I do think that every pattern should be written clearly enough that a knitter with intermediate skills can enjoy success. That doesn't mean that tricky or clever techniques should be avoided. Rather, it simply means that sidebars or a glossary of less standard techniques should be included. My opinion has always been that if a knitter wants to knit a particular pattern, she or he should be able to. I have done all my own knitting for the past several years, but that's because I don't knit that much for publication. Most of my time is spent editing and writing. 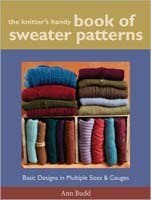 I did get some help with a couple of the sweaters in The Knitter's Handy Book of Sweater Patterns, and was darn happy to get it. My business plan was to have a job. I was lucky enough to be hired by Interweave Press to do what I love and everything sort of evolved through the years. Unlike many designers, I still have a "day" job of editing books for Interweave. And Interweave has been very good about contracting just about every book idea I've have. To top it off, I have a husband with decent health insurance. That leaves me enormous freedom that many knitwear designers don't have. 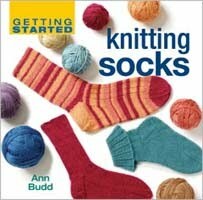 To be honest, I think it's very difficult to make a living off of knitting alone. That's a tough question. So many people have been instrumental in my life, beginning with my father who taught me at an early age that it is possible to love your work. If I were to single out one person it would be Melanie Falick, who, as editor of Interweave Knits, believed in my ability to design and write and pushed me beyond my comfort zone. No. I've been lucky and things have just fallen in place. A business model would be a good idea. Being computer-challenged, I resisted the Internet for a long time. But now I see it as an amazing tool. I started a website and blog (http://www.annbuddknits.com/) in January and am having more fun than I thought possible. (I hope to start selling individual patterns off my website in the next few months.) People who have know me for years suspect that I was abducted by aliens over the holidays. Of course! I wouldn't dare make a pattern public that hadn't been scrutinized by at least one other person. Now that my boys are all teenagers, I have much more time for myself. And because knitting is my hobby, it doesn't feel that I'm always working (though my family might disagree). I've been working freelance for the past couple of years and it has really helped me make time for "life." Ironically, quite often that involves spending time with knitting groups or posting on my blog. On second thought, maybe I don't have a balance. I try to learn from it. I do read the book reviews on Amazon and try to keep those comments in mind as I write and edit books. Typically, though, I discount the really really good reviews and the really really bad ones and assume that the truth is in the middle. Without my job as an editor for Interweave Press, I wouldn't have been able to support myself until the last couple of years when I started teaching and have gotten royalties from so many books. Because knitting is a slow process, be prepared to knit every waking hour. Try to diversify with different outlets for your work.